Monday-Saturday, 10-5. Sunday, 11-5. Friday/Saturday May 1-Christmas, 10-6. 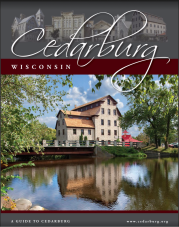 A charming village of shops, boutiques, restaurants, galleries and the Cedar Creek Winery. Our independent merchants are housed in an historic woolen mill, the former Wittenberg Woolen Mill, built in 1864 from local limestone and tamarack timbers. Open daily from 10-5, 11-5 on Sunday. The shops include wine, jewelry, art, contemporary clothing, handmade pottery, European imported Christmas and holiday items, candy, toys, olive oils and balsamics, antiques and collectibles, handmade and re-purposed furniture, vintage clothing, European clothing, soaps and jewelry. A joy to shop and explore! Restaurants include the Cream & Crepe Cafe, featuring soups, salads, sandwiches and main dish and dessert crepes. The Anvil Pub & Grille (with outdoor dining) with a wood-fired oven, steaks, sandwiches and a full bar and Tomaso's Restaurant known for its Italian dishes and pizza. Cedar Creek Winery is a regional destination with more than 20 award-winning wines, cheeses and wine-related items - and a complimentary tasting room. North of Milwaukee, I-43 to Exit 89 in Cedarburg. Left on Pioneer Road. 3 miles to Washington Avenue. Turn right to Historic District. N70 W6340 Bridge Road.